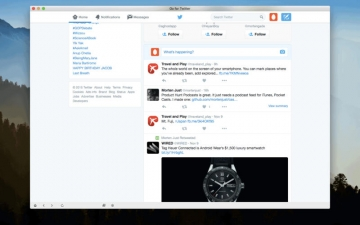 [無料] Go for Twitter | Mac App Storeのアプリ検索・ランキング BuzzMac! Instantly connect to what's most important to you. Follow your friends, experts, favorite celebrities, and breaking news from your menubar.Get real-time stories, pictures, videos, conversations, ideas, and inspiration all from your menubar. If you are an ardent fan of Twitter and want to have a quick access to your Twitter newsfeed, photos, updates on your Mac, then Go for Twitter is the solution for you. This app has been designed and optimized for Yosemite displaying great performance.